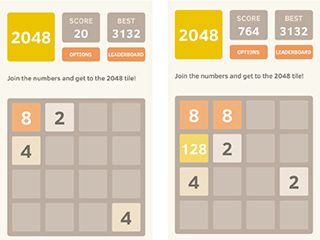 2048 is one of those super simple and the same time super awesome things that people come up with. Just in case you decide to not even try because you have difficulty with number, wait a second and give it a try because it is not that complicated. The game will not probably challenge those who are really into numbers and wouldn't have any difficulty with working on some bigger challenges. While you do need to come up with some sort of a strategy and get the 2048 number, you mostly work with how to move and add them rather than with numbers. All you need to do is find the same numbers and move them around with the arrow buttons. As they collide 2's will turn into 4's, 4's into 8's, 8's into 16's and so on. You keep doing this until you get to 2048. It is fun to move them around randomly and see the numbers gorw on your grid. The only thing is that if you are running out of vacant tiles it's game over, so you'd better add them wisely instead of randomly. The game will not probably challenge those who are really into numbers and wouldn't have any difficulty with working on some bigger challenges. Match 10 would be an example of that. You can download it for your children if they are learning Math. While it is still pretty simple, you still need to work more with your brain and find the best way to get 10 out of the numbers on the grid, because the poins are based on the sequence of your numbers not on the sum of them (1+3+3+1+2 = 10 and 13,312 points). 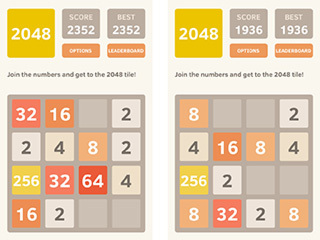 2048 is a great game to challenge yourself when you need a break from reality.